Thanks to a strong labor report on June 1, the stock market has spent the first few days of this month in rally mode. Now, many indices and stocks are nearing or are in technically overbought states, making stock-picking a bit more difficult. So what are the best stocks to buy for June? The tech sector has been flexing its muscles, with names like Amazon.com, Inc. (NASDAQ:AMZN), Microsoft Corporation (NASDAQ:MSFT) and Apple Inc. (NASDAQ:AAPL) all hitting new all-time highs. That of course has driven the PowerShares QQQ Trust, Series 1 (ETF) (NASDAQ:QQQ) to new highs as well. But other important sectors have been lagging and I think we could get some sector rotation over the next few weeks, heading into the start of earnings season in July. That’s not to say I expect tech to do poorly, but I do believe that other groups should start to catch up. 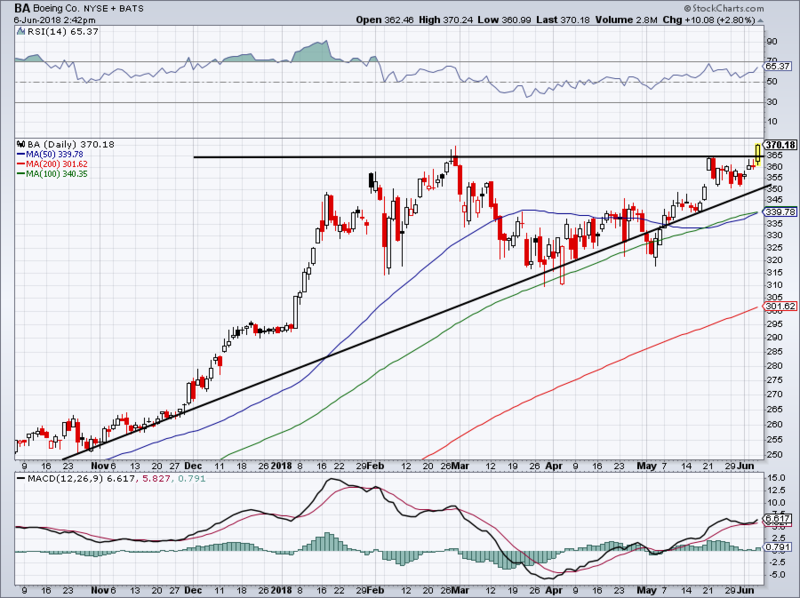 Shares of Boeing Co (NYSE:BA) have been strong lately and broke out to new all-time highs just this week. If tech does take a breather, the transport sector is one that could get a lift. Defense stocks could too, and either way, that benefits BA. 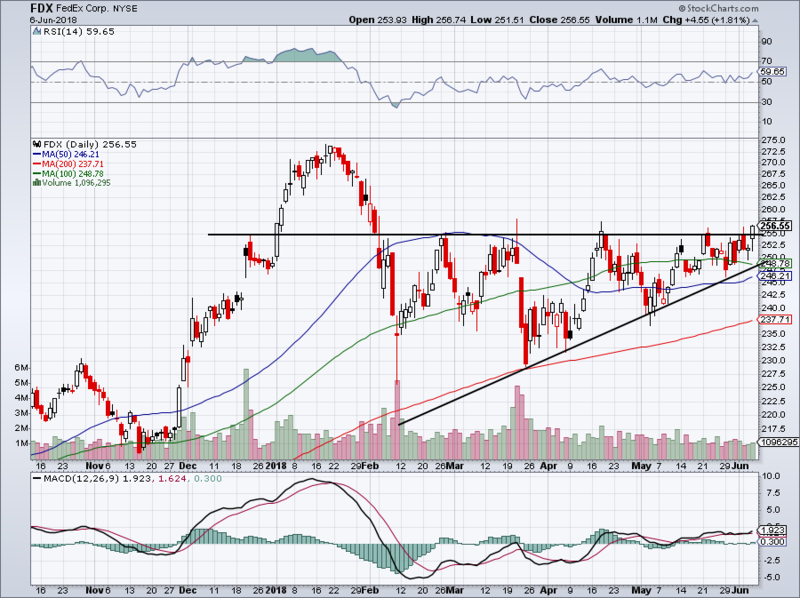 Shares powered through resistance on Wednesday, and if they can hold above this level, BA should continue higher. How high? It’s anyone’s guess right now, but BA could surely be a “best stocks” consideration. With strong underlying fundamentals, impressive cash flow and a respectable dividend yield and buyback, Boeing stock shouldn’t be ignored. If the sector rotation is real, then BA and many others could continue this rally and help push the SPDR S&P 500 ETF Trust (NYSEARCA:SPY) to new highs. Continuing with the rotation-into-transports theme, FedEx Corporation (NYSE:FDX) could be a big winner as well. The company continues to benefit from a number of secular themes. As e-commerce continues to gain traction, FDX is called upon more and more to get items from point A to point B. But it’s not just business-to-consumer. As the economy continues to improve, business-to-business transactions are up as well. A strong economy is the backbone to a strong FedEx and we haven’t seen anything that says the economy is about to go down the toilet. With its reasonable valuation and solid growth profile, FDX stock is finally looking like it’s ready to go higher. FDX stock has been putting in a series of higher lows, but it has been unable to sustainably break through $255. It did on Wednesday, but we won’t know whether that holds up until we get a few more trading sessions under our belt. If it does, FedEx could be one of the best stocks to own this month and I am aiming for it to retest its highs over $270. If not, look for trend-line support to come into play. Another sector that’s starting to heat up? Financials. Maybe this is just a head fake and the group is destined to go back to its lows. However, Wednesday’s rally in the financials is something to take note of. Bank of America Corp (NYSE:BAC), JPMorgan Chase & Co (NYSE:JPM), Goldman Sachs Group Inc (NYSE:GS) and others all raced higher. If the banks can build on these gains, then they could certainly help power the S&P 500 higher this month. This group has solid growth and like FDX, it’s a huge winner on the back of a strong economy. The valuations are quite low as well, sending an attractive invitation for investors to join the bull camp. Maybe this group doesn’t set new highs this month, but they are due for a rebound. 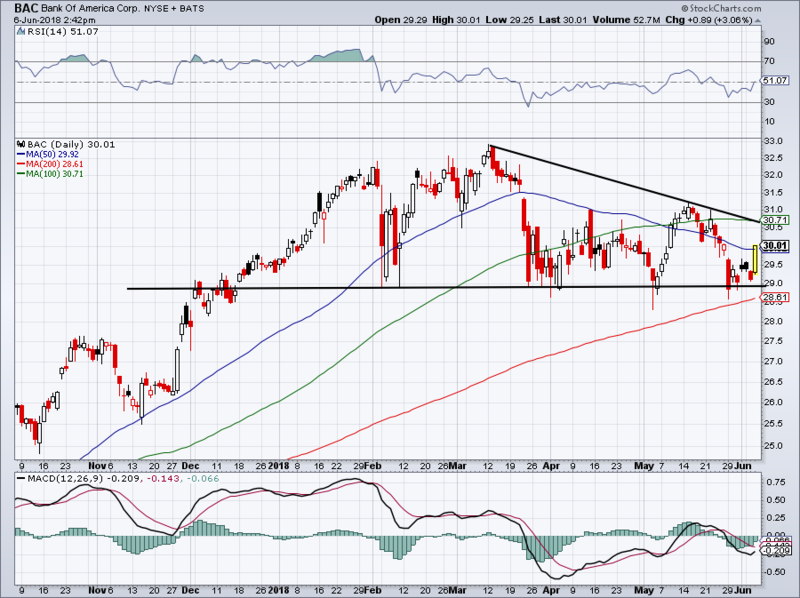 BAC looks solid to me, but so too do a number of bank stocks. We’re only a few days into June and it’s not clear whether these rotations will hold much water. But we’ve seen a few strong rebounds and some stocks breaking through key resistance. If they can keep that momentum up, they could be some of the best stocks to own into earnings. Bret Kenwell is the manager and author of Future Blue Chips and is on Twitter @BretKenwell. As of this writing, Bret Kenwell held a long position in BA, BAC, AAPL and FDX. Article printed from InvestorPlace Media, https://investorplace.com/2018/06/3-best-stocks-buys-for-june/.